The Andronaco family from Victoria has created a very special tribute to the memory of their precious son Antonio. The family liked the idea of having a seat that would last many lifetimes, a seat that could be personalised with wording and images and be placed in a public area so that everyone could see it, read it and think of their beautiful son. 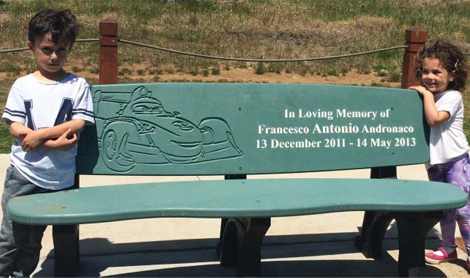 Antonio’s mum Lina said “one seat now sits on our farm and another in a park area at Phillip Island and to us they represent our son’s precious life, someone who was and still is, very much loved and deeply missed and who will be forever remembered."